In preparing for Maggie's relocation to PAWS from Alaska, I traveled with Ed Stewart to the Anchorage Zoo to accompany Maggie on her voyage. Having read the press reports of her two episodes of colic or severe belly-ache during last summer, requiring the help of a crane to get her to stand, I was expecting the worst. I was pleasantly surprised to find her reasonably fit and full of "pep and vinegar and wild for exercise." She did have pressure sores, abrasions actually, on both sides of her face and elbows. These were caused by her going down on concrete and struggling to get up. She also had poor muscle mass and tone. The climate in Alaska required Maggie to stay inside her barn for many months of the year, prohibiting adequate exercise. Considering the challenges faced by keeping an elephant at that latitude, Pat Lampi, the director, and his staff did an exemplary job of caring for Maggie. Their support of her relocation was invaluable to the success of the operation. Maggie's pressure sores are healing (these commonly take many months to grow fresh skin over them). She had a small pocket of concern, not a real abscess, on the pad of her right rear foot, which has resolved. She has muscled up and is ambling all over the African habitat. 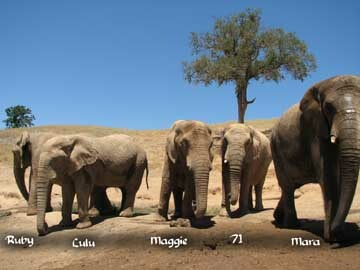 In fact now with all five Africans in a group, I have to look closer to find Maggie! She has really blended into the group. Her veterinary record is pretty boring. She is healthy and happy!